We are both entrepreneurs and own businesses. 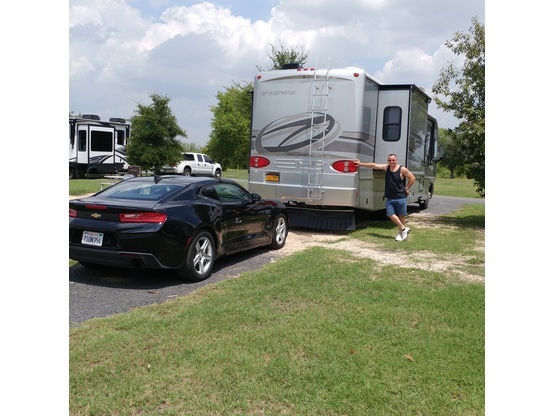 We have a large property and are new to RVing, but see this site as a really helpful place when you are caught on the road! We have 3 grown children, one is an LMT at a prominent spa here, the other is in the Air Force, & the youngest is in college. My wife and I are vegan. We are very into health and fitness. We love going out and listening to music, cooking great food, and enjoying life. Yes, we have a 14 year old Boxer dog named Annabelle. We love everything about being near the water, and little towns with some things to do and see. We have a Class A. It is a 36 foot Pace Arrow Fleetwood with both a bedroom and a livingroom slide-out. It is a 2005 that we purchased in 2017 with only 9,000 miles. It's our first RV and we are really enjoying it. The Compound is in a great location for touring all that the Rochester area has to offer. We spent 2 nights tucked away in a private corner of the yard. Our hosts were great and we enjoyed sharing some funny stories of life on the road. Fairport is a quaint town along the Erie Canal that should be included in your sightseeing. The hosts were able to accomodate 2 rv's which helped us a lot. Their place is very nice and comfortable. Great big yard and friendly people. A perfect place to stop and relax or check out what the town has to offer. Gene & Jenn are super nice. Jenn met us when we came in and was super helpful & went out of her way to get us settled in. We highly recommend "the compound" if you are in the area. We found Fairport to be a really cool little city with a few craft breweries, coffee shops and nice restaurants along the Erie Canal. Just down the road in Macedon is lock 30 on the Erie Canal, a nice place to visit. We stayed at The Compound with friends of ours and the spot was great. Secluded off the road, felt very secure, nice and quiet. The owners were great and had everything laid out and ready for our arrival. Highly recommend staying here for easy access to Rochester and beyond! We spent 3 nights at PDLB2011. Gorgeous spot tucked in back of property. We stayed with another family we have been traveling with, both in c class Rvs. We were warmly welcomed and shown the level spots, where we could fill with water, and 15 amp electric. Didn’t get a chance to hang and get to know them due to very busy scheduales, but felt welcome all the way. Thank you so much for hosting our big group. Our host, PDLB2011were accommodating and very kind & hospitable. Were waiting at our arrival and quickly gave us directions and got us situated in a very nice partially shaded site in one of there drives they graciously gave up for our stay. The Compound provided a nice respite from the busyness of the rest of Fairport even though it's located right in a busy neighborhood. We didn't get much opportunity to visit but they both are very busy with their businesses and I understand the need to take care of that. 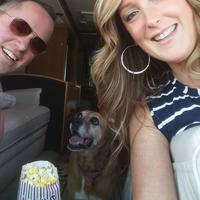 They are a busy working couple that still find time to generally host RVs. They were very prepared for our arrival, even though they were not home. We had a great time with both of you. Thank you for the nice welcoming and all the tips around Fairport and what to do around. Also thank you for giving our dog so much space for running around in your garden! You have a beautiful home and we would definitely come back again ! We were welcomed in from the moment we arrived. They are wonderful people with a lovely home and beautiful furry friend Annabelle who also talked to us. We felt very safe and it was a perfect place for us to explore the local area on our bikes and take our children to the museum. Both of you are welcome to Australia anytime and we would love to return one day. Thanks for the stay we really appreciate it. Very friendly host and great site ! Our hosts were very friendly and welcoming. Very helpful and generous regarding our needs. We have had a nice and funny chat with Jeff. Wish we have had more time to know them. We highly recommend this host. I stayed with them for a night in mid-November. They have a Class A with plenty of driveway and turn around space, so you should have no problems getting in and getting set up. Once I was parked, they handed me a 110 plug and I settled in to this mostly quiet place (the ice rink next door had period buzzers that I could hear, but they were quiet after 9pm). Very quet, clean and safe site. We really appreciated Jeff and Jennifer's hospitality. Their property is in a rural section near Rochester, NY, and very easy to locate. The site was exceptionally level, clean, and made us feel very secure. They we very helpful with power hookup and water fill for our holding tank. We spent only spent one night with PDLB2011, but the short time we were there, they were very accommodating. The site was easily accessible, and meet all of our needs. We highly recommend staying here when in the area, beautiful area, close to lots of things to do, and great host. I had so much FUN with these guys! They are wonderful hosts and I am so thankful for their company and hospitality! It's a big beautiful piece of property with many options to park and room to roam surrounded by forest. They are very down to earth and it was nice to stay with some hosts with some pep in their step! I appreciated them letting me tag along and hang out with them. Thanks you guys! We stayed one night and really enjoyed meeting our hosts and their family. We had wonderful conversations getting to know one another and felt we left with new good friends. A convenient place to park, a quiet neighborhood, and close to shopping, fuel, and the interstate. I hope they get the chance to come visit us when they are in New England. Many thanks for everything! We had a great time and are really grateful with our hosts for letting us stay for 2 nights at their property, good space for our 32' plus toad. We enjoyed our conversations and finding out things in common like our diets and lifestyle. We appreciate the info you guys gave us as well as the delicious meatless options you shared, and hope to see you again sometime in the future. In the meantime we'll follow along your experiences through social media!